In July, it was my privilege to interview Norman Phelps in what proved to be his last Summer upon the lake at Victoria Park where he sailed boats for more than seventy years. Norman died on Christmas Eve and today I am republishing my pen portrait as a tribute to a wonderful man who became a legend in the world of model engineering. 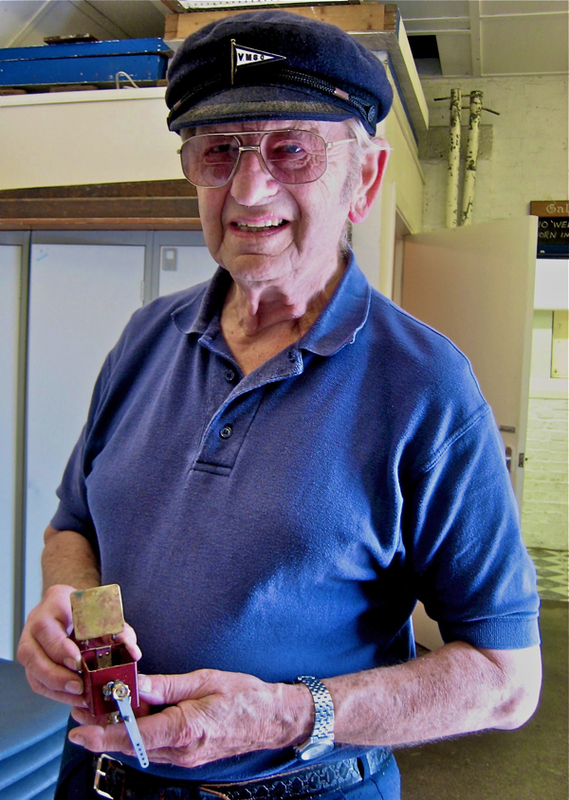 This is Norman Phelps, President of the Victoria Steam Boat Club, proudly displaying his ratchet lubricator that he made recently – just the latest example of an enthusiasm that began in 1935 when, at the age of five years, he fell into the boating lake in Victoria Park. 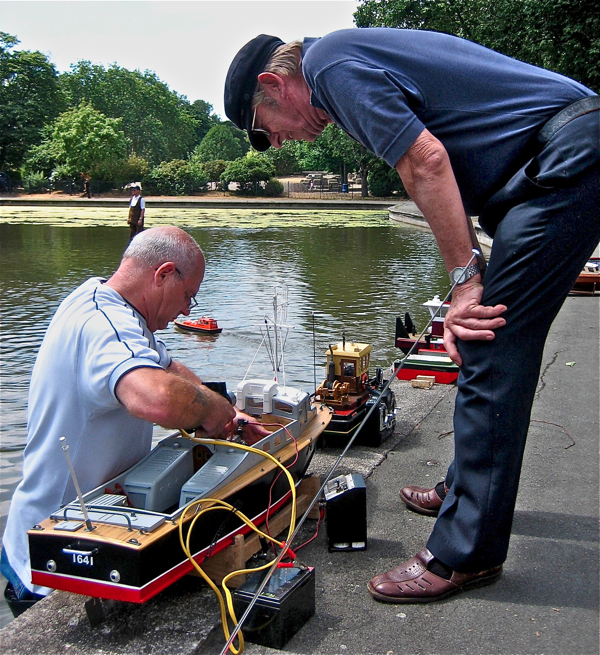 It might have been a tragedy but instead it was the beginning of a lifetime’s involvement with model boats, and seventy-five years later, you can still find him at the lakeside on Sundays, giving the benefit of his experience to the junior members of the club. Norman was understandably wary of speaking to me because the last time he gave an interview in 1951, he got taken for a ride by the News Chronicle. Although Norman spoke at length about the venerable club, all that got published was a souped-up account of how he courted his wife at the lake over the model boats. Seizing the opportunity to set the record straight, Norman generously sat down with me next to the boating lake last Sunday and spoke with lyrical ease. “I was always known, not by my father’s name of Phelps, but as Watson – because my mother was famous as “Dolly Watson” on account of running the sweetshop in Rockmead Rd, where I grew up. I stayed in London all through the blitz and I saw the city burning and I saw this park blown apart, and our house was destroyed by a rocket in early 1945. Because of the bombing everyone knew everyone else. I saw neighbours dead on the pavement and I heard people crying out from beneath the wreckage of buildings where we could never dig them out. I saw the Home Guard practising with wooden rifles because we didn’t have real ones. It was crazy! Funnily enough, I married a girl from Seweston Rd, on the other side of the park. I met her dancing at the Hackney Town Hall and because we were keen dancers and won prizes, we decided we would race model boats and see if we could win. We joined separately, but we did our courting through the club, and she won a lot of prizes and ruffled a few feathers. She’s been running boats her whole life and she still is at seventy-eight. We got married in 1956, had our reception in the clubhouse and I was made secretary of the club at the same time. They gave us a presentation box of cutlery as a wedding present that we have today. In the early days, I supported my wife because she had such an enormous predilection to compete. She’s won so many prizes, we’ve got boxes full. If we turned up to compete, other people would say, “Let’s give up now!” It was the art of straight-running. I did the designing, and she did the maintenance and cleaning. My wife was the talent, and I tended to stay in the background and be the club secretary and that was enough. “Who needs a computer?” asked Norman in derision, “I have a problem with the lubrication of my boat engine to solve.” But in spite of his disaffection, the contemporary world is affecting the boat club in ways that are not entirely disadvantageous, and even skills nurtured through computer games have their place here. “We have lowered the age limit for membership from twelve to ten, because nowadays ten-year-olds are better with the radio controls than we are.” declared Norman proudly. I can understand Norman’s ambivalence when he has lived through such big times, during which the Victoria Model Steamboat Club sailed on as a beacon of civility across troubled water. Its survival today as one of only two in existence (along with Blackheath), makes it all the more important as a reminder of the best of that other world, before the computer, when just a few people sat behind desks and most possessed a skilled trade that enabled them to earn their living and achieve self-respect too. Lovely, and I liked the way that the title of this post can be read in two ways – a model president, and resident, indeed. Really enjoying your blog – hope to be a regular visitor this year. Happy New Year! I loved sailing my shop-bought toy boats on Blackheath pond as a boy in the 60s, and remember gawping with envy at the wonderful craft sailed by adults, up to fully rigged fighting galleons! 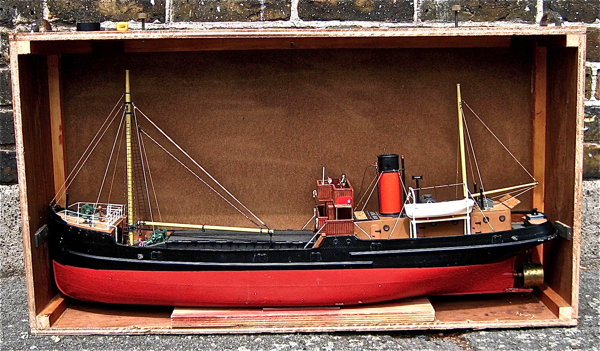 A train-driving acquaintance of mine was making a 3-4 foot long scale model Royal Navy destroyer when I left the UK six years ago, and he was intending to sail it. I lost touch with him, but hope he is continuing this fine and skillful hobby/passion.